We're exhibiting at Cloud Expo Europe again! This year, we will join our closest partners, Supermicro, on stand C1956 to demo the latest and greatest disruptive technologies. Cloud Expo Europe is home to tens of thousands of senior IT buyers and executives who come to source solutions and services from across the IT landscape. It’s a network of prospective customers spanning the breadth of the cloud computing business chain, from enterprise, SME’s and the public sector to cloud service providers and the wider cloud industry. All seeking essential guidance towards the solutions they need to transform, maintain and grow their businesses. 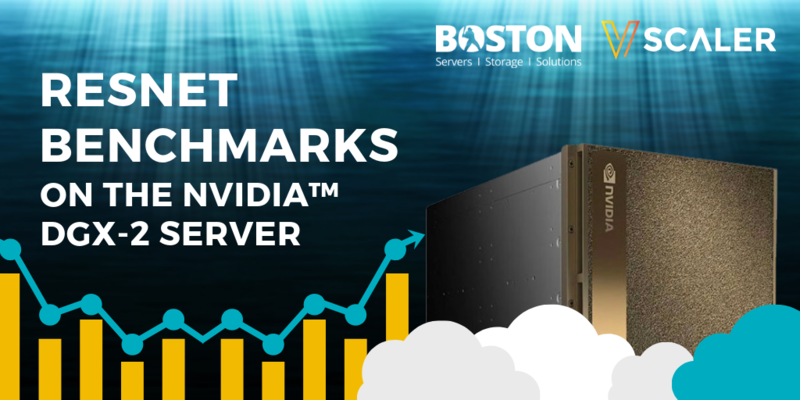 Boston's cloud partner vScaler has recently ran ResNet Benchmarks on the NVIDIA™ DGX-2 Server. The worlds of AI and HPC have an insatiable appetite for more and more performance. With the rise of GPUs being used to run a lot of these AI frameworks, it's only fitting that we put the fastest system in the world to the test. One of NVIDIA’s DGX-2 servers arrived onsite recently, and our engineers have integrated this with our internal vScaler lab facility. Make sure to stop by Stand C1956 for the latest innovative hardware! Want to find out more or book a meeting? Get in touch!